After Effects CC brought us a feature called “Mask Tracker” which allowed us to track masks into our shots very easily. It’s a simple tracker that moves our masks around to match our shot’s movements, useful for color correction or very basic edits such as blurring the masked region. Unfortunately, utilizing the tracking data for things other than moving the mask path around was very limiting, but MaskTracker+ is here to solve all that. MaskTracker+ by mamoworld is a script that utilizes the tracking data from AE’s Mask Tracker and effectively utilizes that data in more useful ways similar to planar tracking. Exactly how good and effective is MaskTracker+ and should you buy it? Here’s my full review. Disclaimer: I am not sponsored nor do I receive any monetary gain from mamoworld. The opinions expressed in this review are truthful my own opinions. 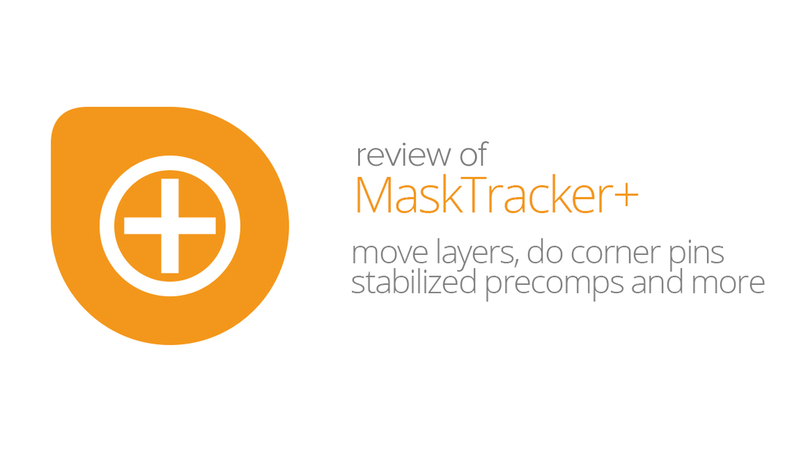 Stabilized Precomps – The popular stabilized precomps of MochaImport+ are also available in MaskTracker+. Track an object with the mask tracker and MaskTracker+ creates a precomp for you that shows a stabilized view on the tracked object. Stabilize Footage – Stabilize shaky footage based on a mask track. MaskTracker+ can either eliminate the movement completely or create an advanced stabilization rig where you can fine tune the amount of smoothness for position scale and rotation independently. Move Masks – If you have several masks moving in the same way, you can save time by just tracking one mask and applying the tracking data from it to the other masks. In terms of features, MaskTracker+ is very similar to MochaImport+ with the same options. The benefit is that you get to stay 100% in After Effects without having to leave the application for Mocha. This speeds up the workflow tremendously for most shots (unless you have some complex shots that AE’s Mask Tracker can’t track well). You simply create a mask, track it normally using AE’s Mask Tracker, load the data into the script, then choose what you want to do. It’s fast, it’s quick, and it’s very simple. Having MaskTracker+, you can hop right into using it immediately in your projects without any steep learning curve or poking around. The script is well thought out and works as you’d imagine it to. Never once was I thinking, “Man, why do I have to do it this way?” The stabilized precomp is a lifesaver for painting/patching things out and is probably my favorite feature of this script (and also MochaImport+). It allows you to modify an area without having to worry about all the changing movements and tracking. Make all your edits in a still environment, and let MaskTracker+ track it back into the shot. The Stabilize feature works pretty decent and is much faster than Warp Stabilizer if your shots aren’t too shaky. You get a ton of controls to fine tune your stabilized footage such as smoothness amount and zooming % to hide the rotating shot. I recommend using it to stabilize moderately shaky footage if you don’t want to wait for Warp Stabilizer. Everything else such as the Move and Corner Pin feature works as expected and the whole script is well documented with help tips in case you’re confused as to what the script does (or wants you to do). Although using the script and understanding what the script does is very straightforward, knowing what tracking method to use isn’t such a simple process. This isn’t directly MaskTracker+’s fault, but its something to note. Even though the mask seems to be tracked well, be sure you’re tracking method is the right method for what you’re doing or MaskTracker+ will throw off what you’re trying to achieve. Sometimes tracking Perspective is what you need, sometimes Position, Scale, Rotation is good, sometimes you need Skew. It all just depends on your shot, so this will take some experimenting to get MaskTracker+ to execute the task perfectly. MaskTracker+ is a must-have tool if you do any sort of tracking, compositing, or painting/masking in your projects. Efficiently compositing/masking things out isn’t the easiest task in After Effects, and MaskTracker+ makes it just a bit easier to work with. It’s simple, it’s easy to use, it works well, and it’s affordable. You probably don’t need to run out and buy this guy if you already have MochaImport+, unless you want to stay completely in After Effects. The script does its job well, and isn’t limited by its features, but limited on how well After Effects can track your masks.